I am involved in a volunteer project, right now, that is so exciting, I wanted to share it with my readers. It is the transcription of an Ohio woman’s diaries. I have written about transcribing for the Smithsonian Institution before, back here. People from around the world, we’re called volunpeers, can create a login, self-train online, and begin transcribing digitized collections for any of the Smithsonian archives or libraries that have uploaded projects. What so impresses me is that an American institution whose aim is to preserve history has deemed that the record kept by a woman who was born in, lived in, and died in the same Ohio town could make a contribution to the American story. Here is what the diaries look like. 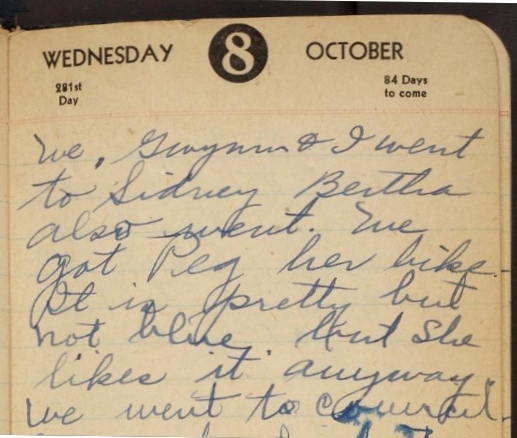 Page 6 and 7 of Annamae’s 1942 diary. As you can see, the volumes are small, 6-8″ tall. The transcription of the diaries is a project of the Archives Center for the National Museum of American History. Annamae was born in Logan County, Ohio, in 1903 to Jacob Walter Barlup and Minnie Gwynn. She married Clarence F. Myers in 1923. Annamae had three children. In addition, she also cared for aging relatives and occasionally provided childcare for neighbors. She passed away just before her 82nd birthday. The entries are short. The amount she accomplishes each day often sounds exhausting (especially in harvest months) and ambitious. At times, the diaries are like a modern version of the Martha Ballard diaries that Laurel Thatcher Ulrich studied for her dissertation and book, A Midwife’s Tale. 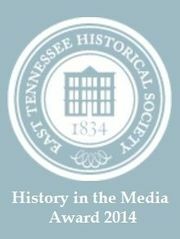 Dr. Ulrich examined the numerous short, sometimes cryptic, entries and used court transcripts, maps, church records, town reports, and other contemporaneous documentation as a canvas from which to illuminate Martha’s life, her place within, and her impact upon the community. In the documentary about Ulrich’s research and Martha’s life, Ulrich describes her experience of going from archives to archives inquiring about any materials they might have on women. She was repeatedly told, “We have very little.” When she came across the Ballard work in the Maine State Library and Archives, she was told off-handedly by staff that there wasn’t much there. Thankfully, she ignored the staff. 1. There is no such thing as women’s work. Annamae’s duties ranged from baling hay to washing laundry, from attending grange and school meetings, to sanding the floors and supervising hired work. On this day, Annamae cooked breakfast, canned 5 qts of pickles, dressed a chicken, cleaned an antique bench and helped bale 263 bales of hay. 2. She was concerned her voice would not be heard. Annamae ran for a local office in 1947. 3. She found humor in her life. I sometimes find myself laughing out loud as I transcribe an entry. 4. The diaries describe how much work and ingenuity it took to survive lean times. Waste not, want not. Recycling and re-purposing wasn’t a trend but a necessity. 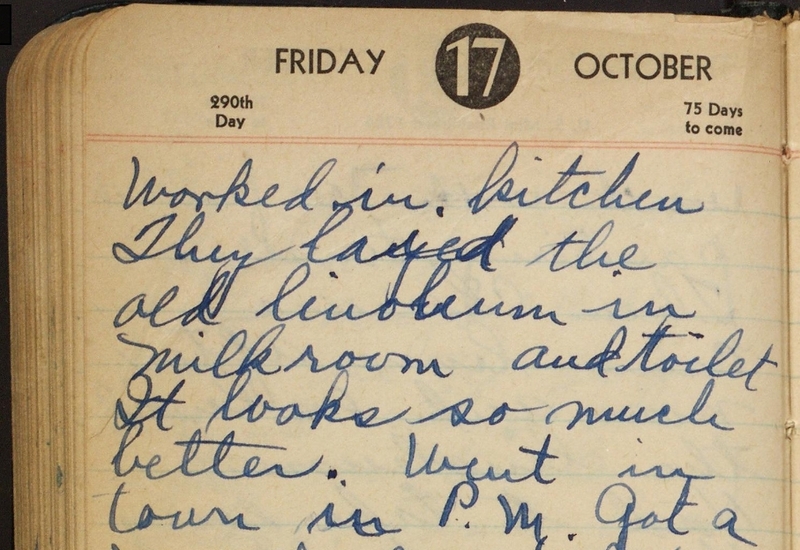 On the previous day, Annamae records that they put a new floor in the kitchen, but on this day, she explains that the old floor was re-installed in the milk room and toilet closet. 5. Annamae wrote in and consulted her diary more than once a day. Attesting to the diaries’ importance in her life, there is evidence that Annamae often wrote things in advance, using the diary as a kind of calendar or planner. 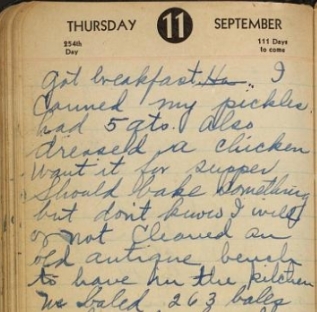 Other times, she would write what she was going to do that day, then in the next line would record that something came up and she didn’t get it done; proving that her entries were created throughout the day (including page 7, above). 6. Rural life had its excitement! I finished indexing for FamilySearch one night and thought “I will transcribe just one page of Annamae’s diary before I close my laptop.” Well, in that entry she records that she was summoned to appear in court due to a neighbor filing a complaint against her. Of course, I had to transcribe a few more pages until the matter was resolved! Two days later, Annamae made her appearance and all went well. 7. The diaries dispel the ideal of making a living simply by raising and selling crops. So many more money-making and saving activities were conducted daily. The diaries also prove that farms and farmers were integral to each others’ survival in the community. The bottom third of Annamae’s entries often contained tallies of financial concerns, such as rent collected on land or farm equipment (or saxophones), sales of produce and milk, as well as payment of personal loans. I am excited to hear about what great applications scholars will make of the information in these diaries. In addition to the more serious content relating to farm and community, there are numerous entries of social activities and references to popular culture. What is so beguiling about Annamae Barlup Myers’ herstory, is that she seemed to weave these duties and interests together seamlessly. 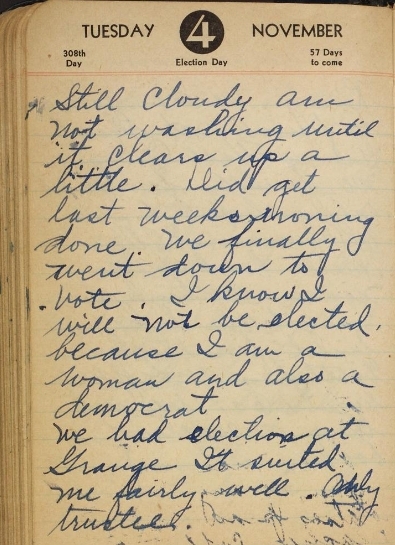 This entry was posted in Archives and tagged archives, diaries, digitization, Smithsonian, Women. Bookmark the permalink. I’m a fellow transcriber in this project. I’ve been struck by Annamae’s reticence to express feelings. Perhaps this was expected of women then. There were times when she definitely seemed to be “biting her tongue.” Yet, for the most part, she seemed very joyous, sociable and content. A fascinating glimpse into someone’s ordinary everyday life. I wonder if the acceptance she had for herself she also extended to others. I notice several times a week her day not going as planned but she does not flog herself for it. She makes the most of each moment. A good lesson: Joy and contentment start within. Thanks, Rosalie. Great article on this collection and I am pleased that you like them. 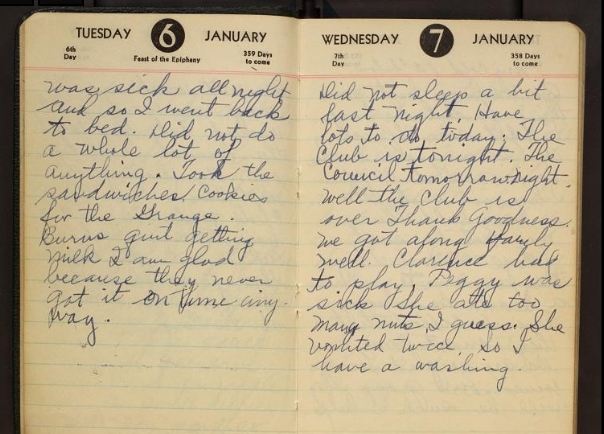 I am the archivist who has scanned the diaries and posted them to the Transcription Center. I am about to post, by the end of next week, the other half of the diaries as they range in total, 1931 to 1967. 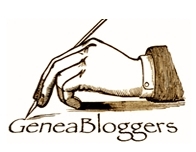 Thanks for all your help in transcribing them and, again, great article. I envy you for the work you get to do. I really do love the diaries. I would be so interested to know how the SI ended up with them instead of a local repository in Ohio. Thank you for your very kind comments, Joe. What a great project! I enjoy perusing old diaries. Wow! Very interesting. Puts one right in her time period.